I recently started running a D&D game using the Hoard of the Dragon Queen adventure from Wizards of the Coast. This adventure is the first book of two in the Tyranny of Dragons story that combine to create a full adventure. The group that is playing consists of a DM (me) plus several adults and some of their sons. So, we have a group of 30 to 40 year old players with a couple of 9 year olds. Ok, after re-reading that last sentence, I realize it could be interpreted as a group of one year old players with 30 to 40 members, but I actually meant that some of the members are in their 30s and 40s. I’m feeling too lazy to go back and change it, which makes even less sense when you realize that it took longer to type this paragraph than to re-word the previous one. The first session went really well, and the adventure is pretty good. So far, I’m liking it quite a bit better than The Lost Mines of Phandelver from the Starter Set. It feels more gritty and realistic, and being an “adventure path”, it just feels more epic. Yesterday I talked a little bit about using a microphone on stage and why you need to have plenty of volume coming from the amp to get a good mic’d sound. While there are plenty of times that having your amp loud on stage is perfectly acceptable, there are instances where this can be a problem. Some church worship bands, for instance, understandably require low stage volume for all instrumentalists. Low stage volume also cuts down on speaker beaming, which is what happens when someone’s ears are the direct path of the speaker and they get all of the very harsh frequencies from the center of the speaker cone. If you’ve got a multi-fx pedal, no problem, but what if you need to use an amp and you need some volume to get that really great tone without blowing grandma’s wig off? What can you do? I’ve been in this situation before, and after trying a number of things over several live sessions, I finally found a solution that worked very well. 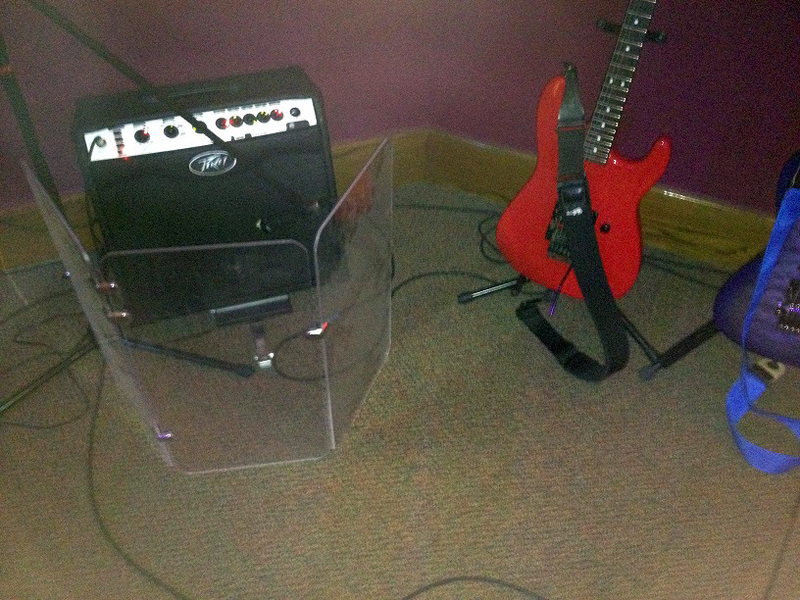 I found some old kick-drum shields and placed them in front of my amp to block the loud volume from overpowering the room and to block the harsh tone caused by beaming from hitting anyone square in the ears. One question I see being asked often on the Internet is, “How do I get a good guitar tone for playing live that will be heard in a mix.” There is a lot of good information to be found, and I’m going to add some things I’ve learned from my experience to the mix (pun intended). 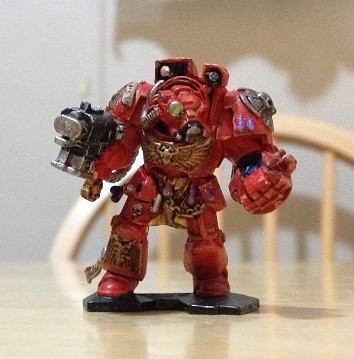 I mentioned in my Space Hulk 4th Edition review that the miniatures that come with the game can be painted. I’m far from a good miniature painter, but I do like to sit down and do some painting once in awhile (and by once in awhile, I mean rarely, as the fact that I have painted exactly 1 complete miniature and 5 miniatures very slightly in the last 6 months will attest to). So the one miniature that I have completed is the Omnio figure. 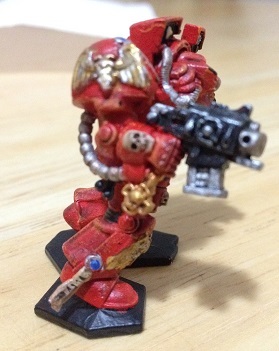 Being that, as mentioned, I’m not the greatest painter of miniatures, I’m pretty happy with how it turned out. 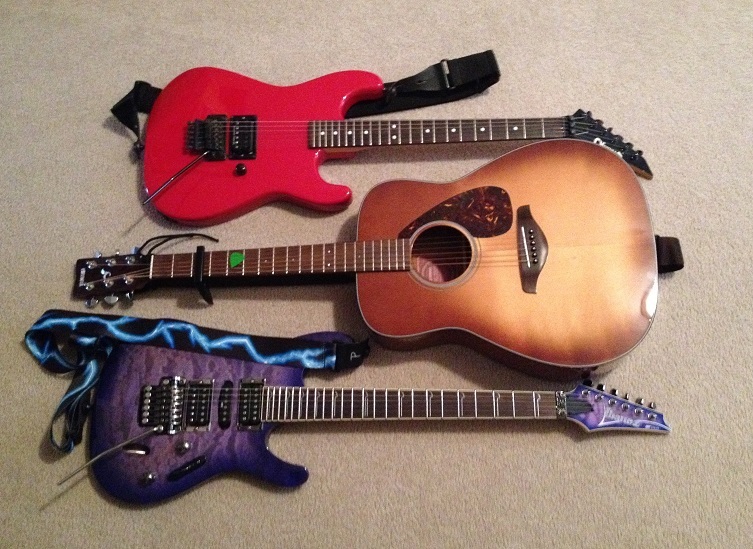 Ok, I admit that this is not directly guitar related, but it is tangentially related. 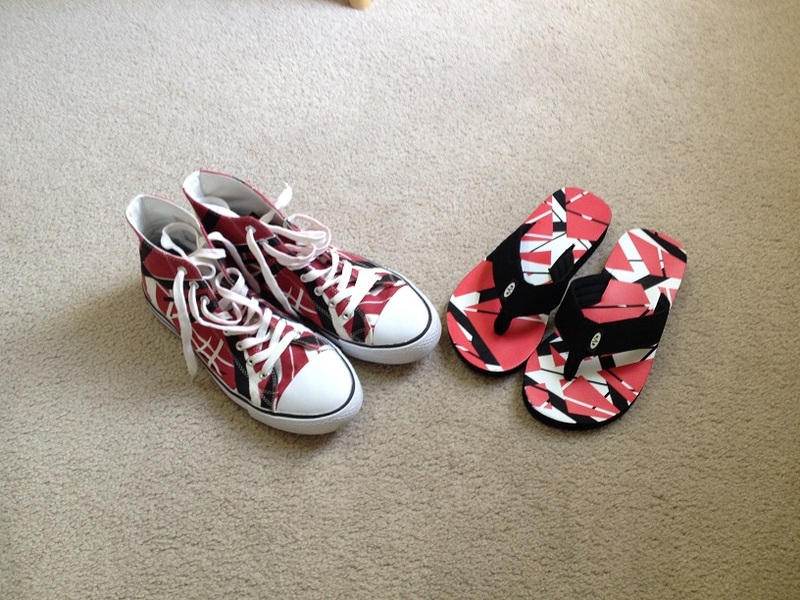 After I purchased our Van Halen tickets earlier this month, my wife bought me the greatest pair of shoes I’ve ever owned for my birthday. She also bought herself a pair of flip flops to wear at the concert (it’s at an outdoor venue and will be in late summer). I’m working on doing a recording of Van Halen’s Ain’t Talkin Bout Love. I recorded vocals myself but it’s just a little out of my range, so I’ve asked my brother to record the vocals instead. I’ve got the basic mix down, and once I get the vocal track from him, I’ll do a final mix/master. We’re basically collaborating through email as I’m in Ohio and he’s in Tennessee. As usual, I’m using a drum loop, and I’m playing all guitar and bass parts. 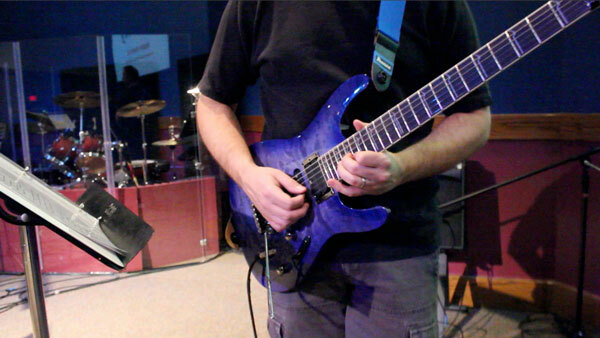 The guitar is a single take, including solos, with some post processing effects added to the solo sections. Once my brother is finished recording his part, I’ll upload a final version. 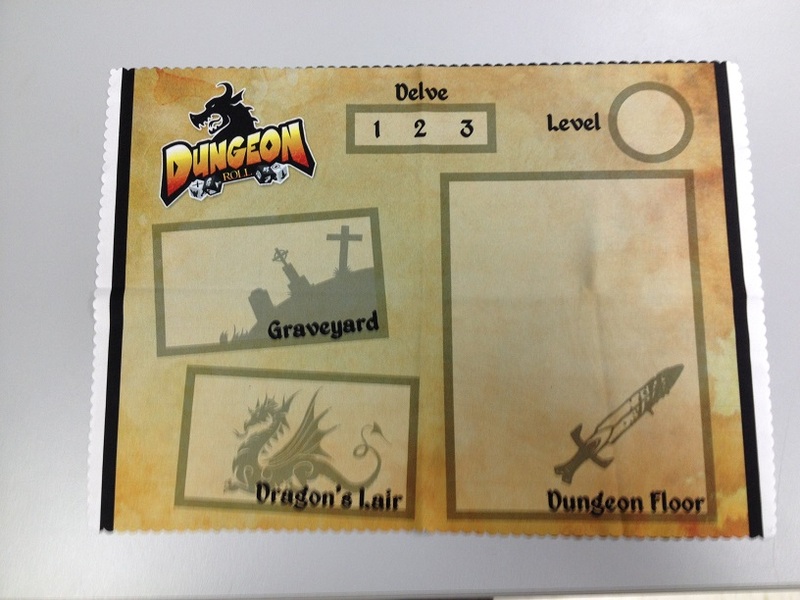 I mentioned several weeks ago in a review of the Dungeon Roll dice game that I had ordered a custom play mat printed on a glasses cleaning cloth. I was away for about a week and it had arrived in the mail while I was gone. I’m pretty happy with how it turned out (the blur in the bottom right of the picture is not actually on the mat, but is just apparently from me shaking with excitement when I took the picture. Or maybe just bad focusing, I don’t know). 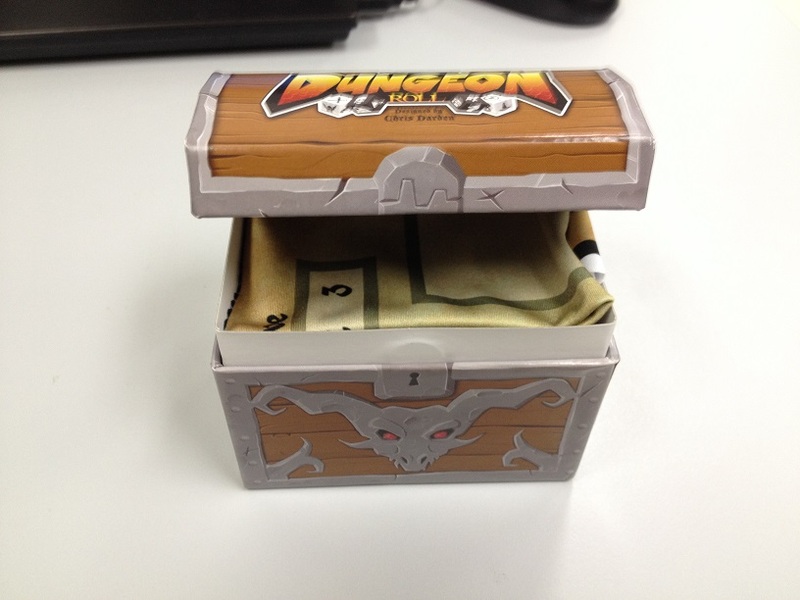 The great thing about having it printed on a cloth rather than using a paper print out is that it folds up and fits nice and neatly in the Dungeon Roll box. As I mentioned in the other post, I got the image from boardgamegeek.com where the creator of the image uploaded it to share with the gaming community. It’s no secret that I’m a pretty big fan of Dungeons & Dragons. Just a click or two around the site will make that pretty apparent. Having said that, I’ve always wanted a board game that captured at least a little bit of the D&D feel, but without the need for a large chunk of time to be set aside to play, and without the need for a complex rule system. 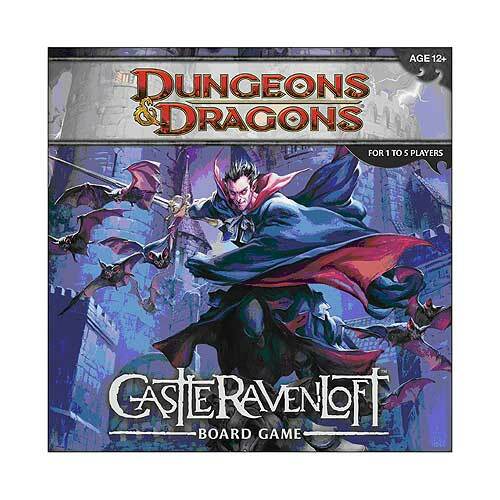 So, it was with great anticipation that I ordered the Castle Ravenloft board game, which is part of the D&D Adventure System series of board games. A couple of weeks ago, I mentioned that the new Line 6 model packs for the HD500X multi-effects pedal had been released. One of my main interests in the new model packs was the inclusion of the Peavey 5150 amp model, which Line 6 has named “PV Panama” in keeping with their practice of naming amp models in creative ways, rather than naming them the same as the real amp. Now that I’ve purchased the model packs, I created a sample recording of the raw sound of the 5150 model on the HD500X.